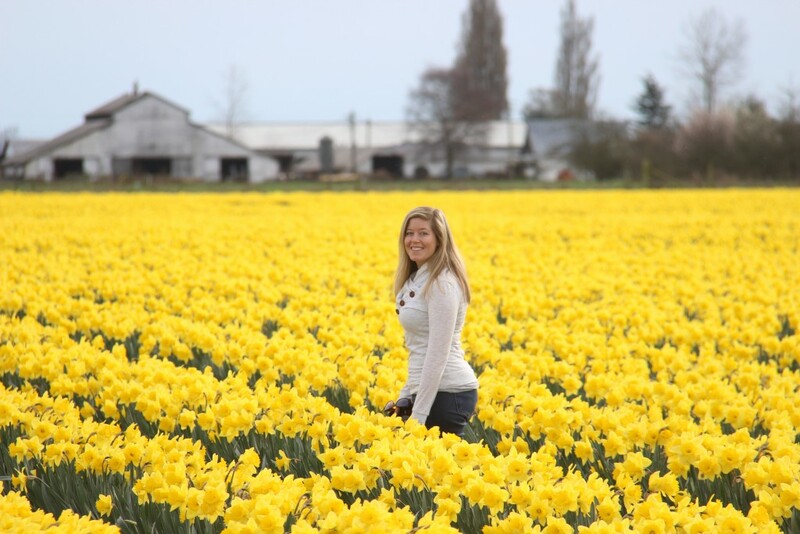 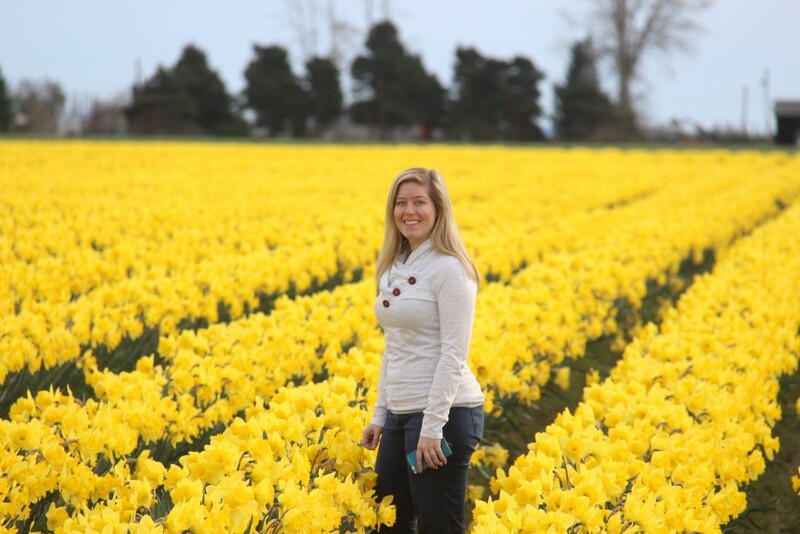 Daffodils are my absolute favorite flower, so when I heard about the Skagit Valley daffodil fields, I knew I had to go! 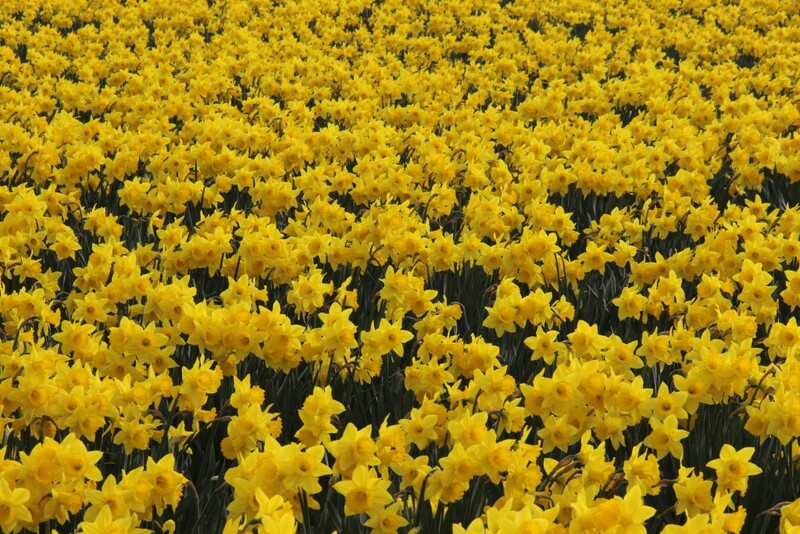 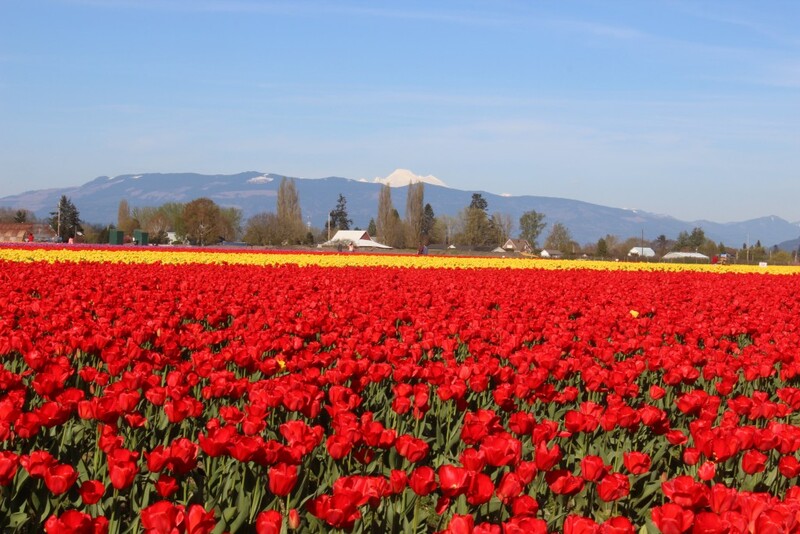 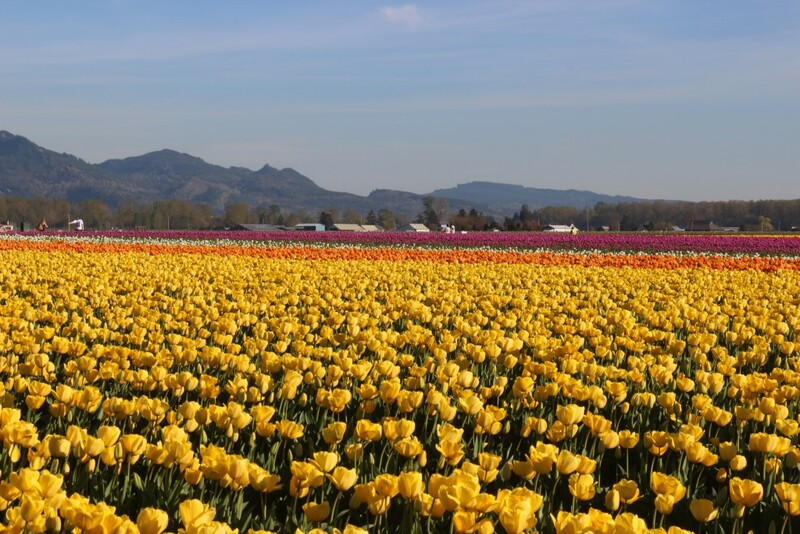 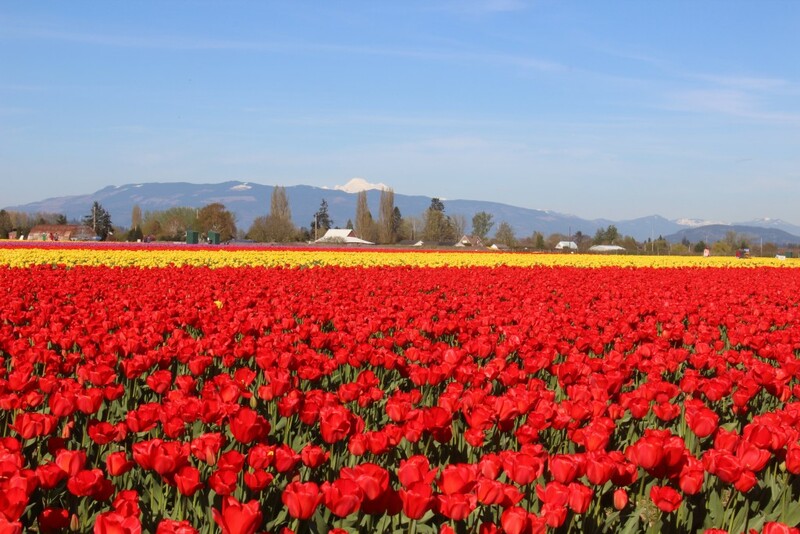 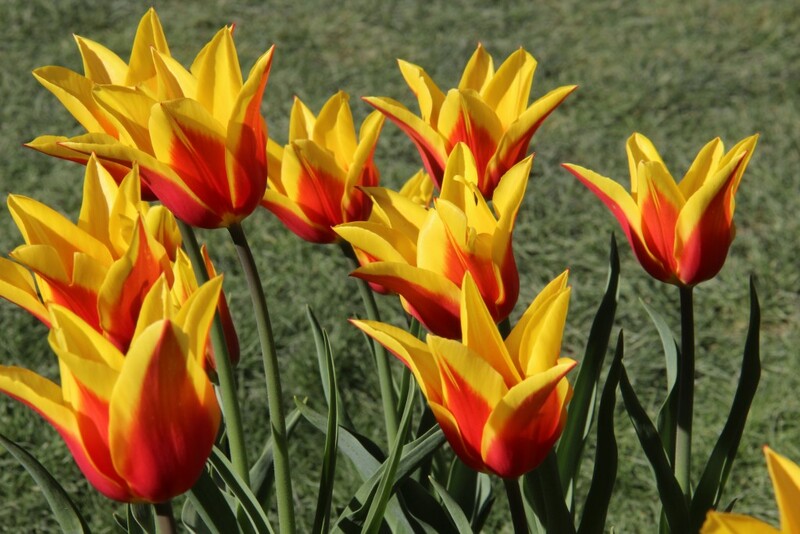 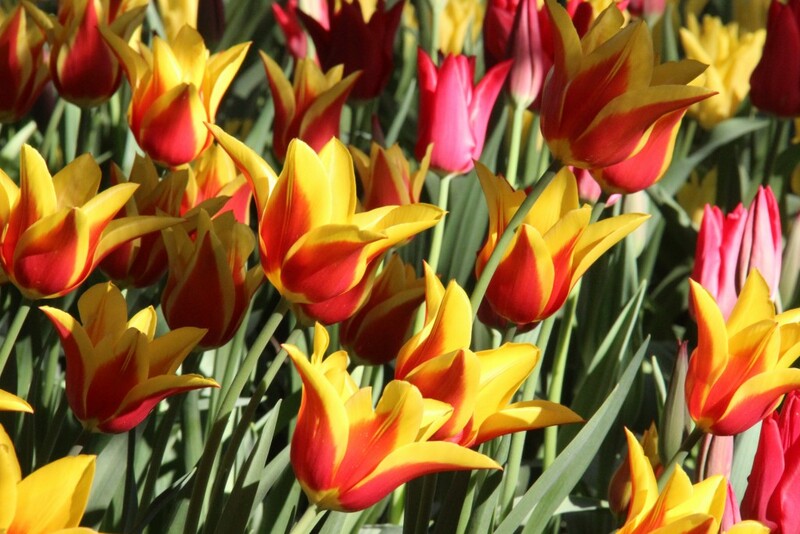 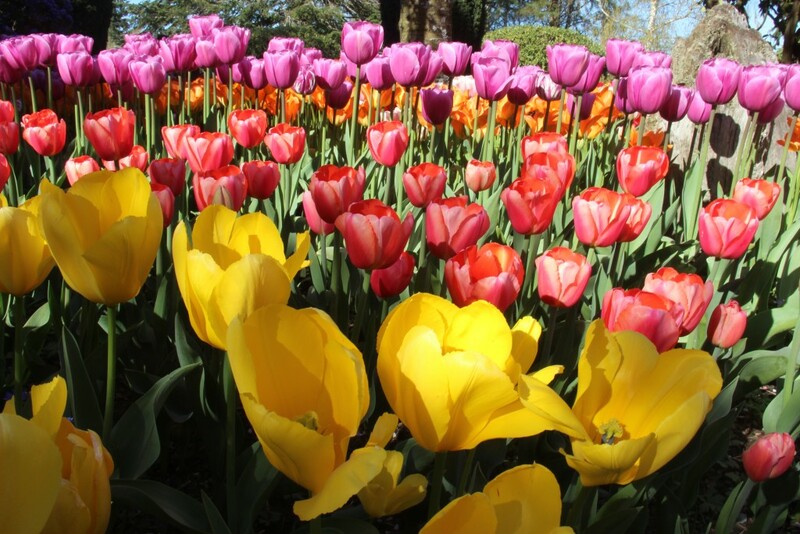 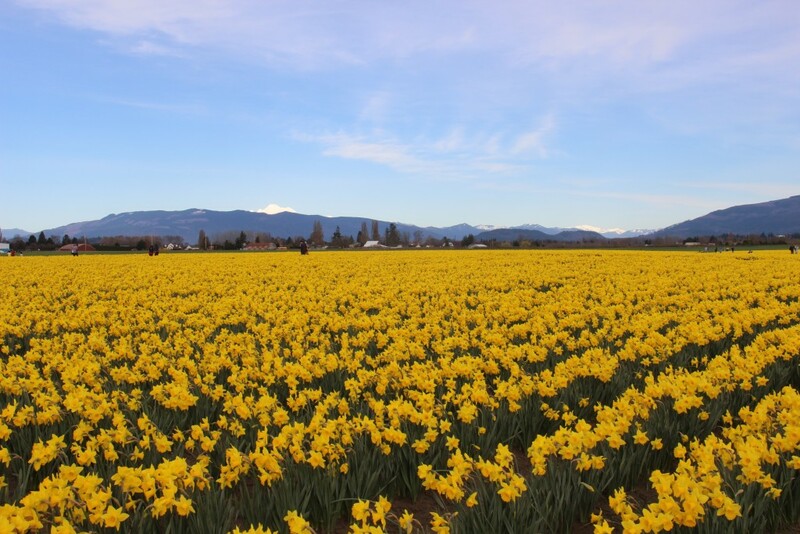 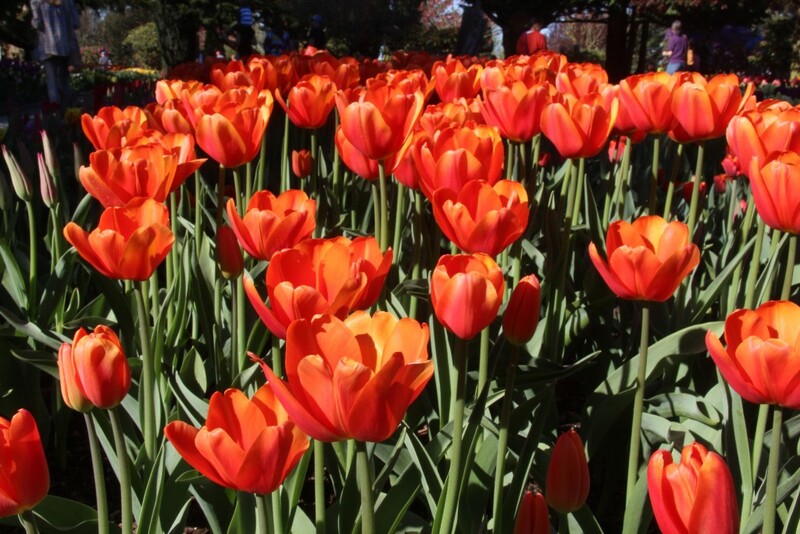 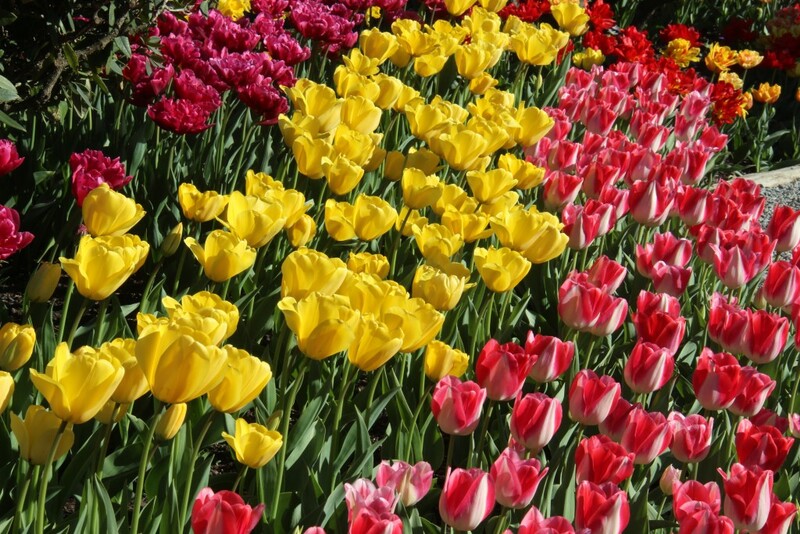 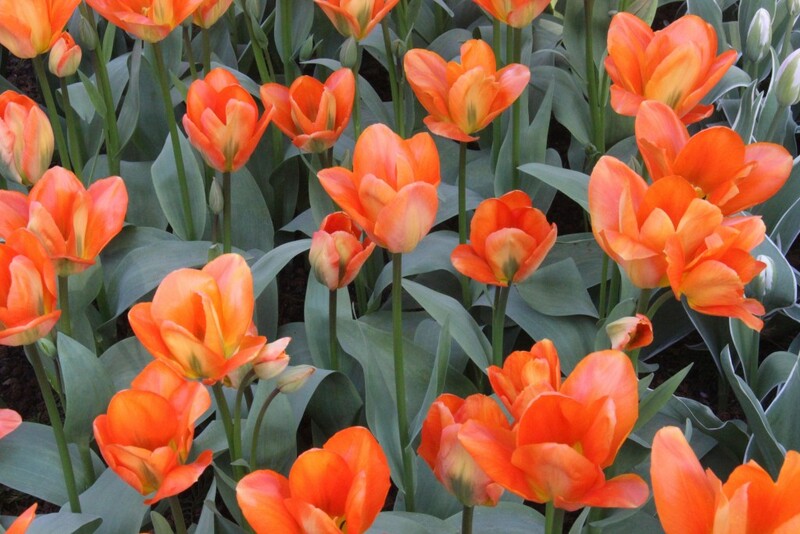 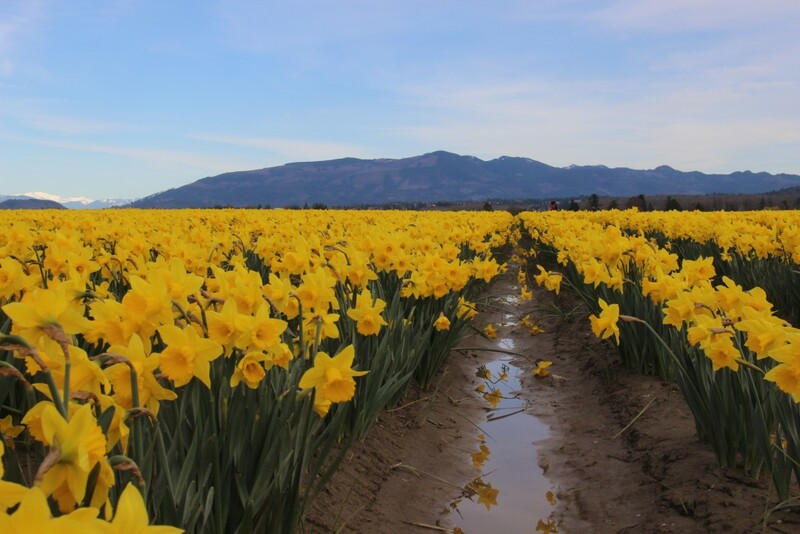 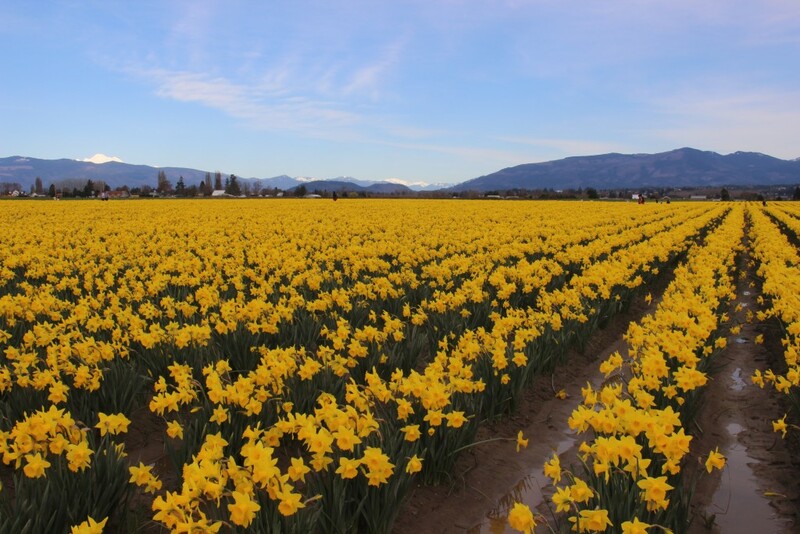 Skagit Valley is most famously known for the tulip fields that bloom in April, and many people don’t know that the fields are first blooming with daffodils in March. 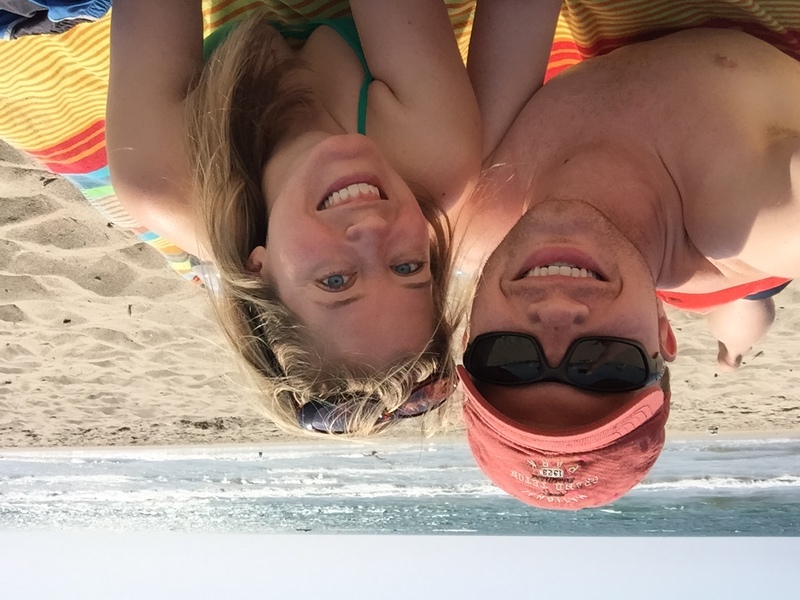 On one randomly sunny Saturday afternoon in March, we decided to head up and take a look! 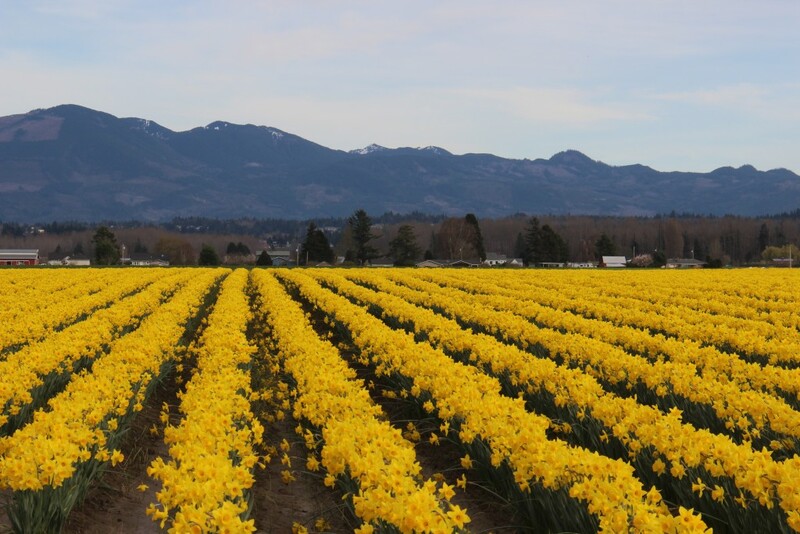 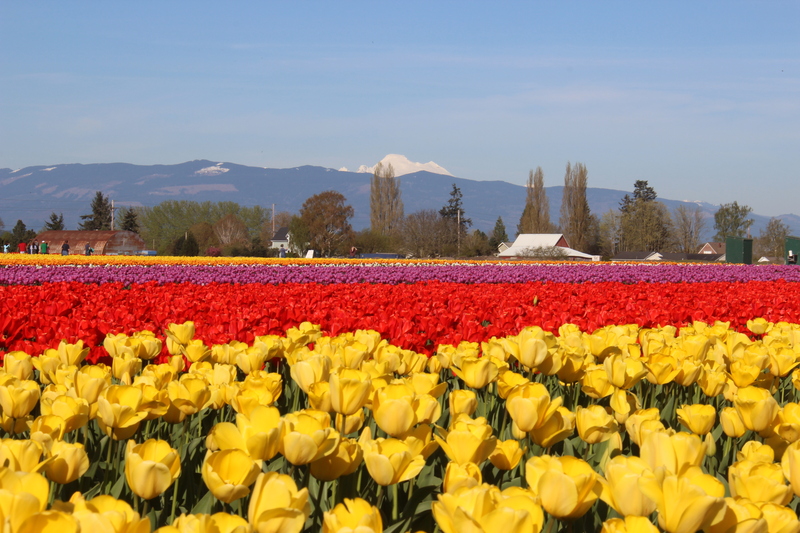 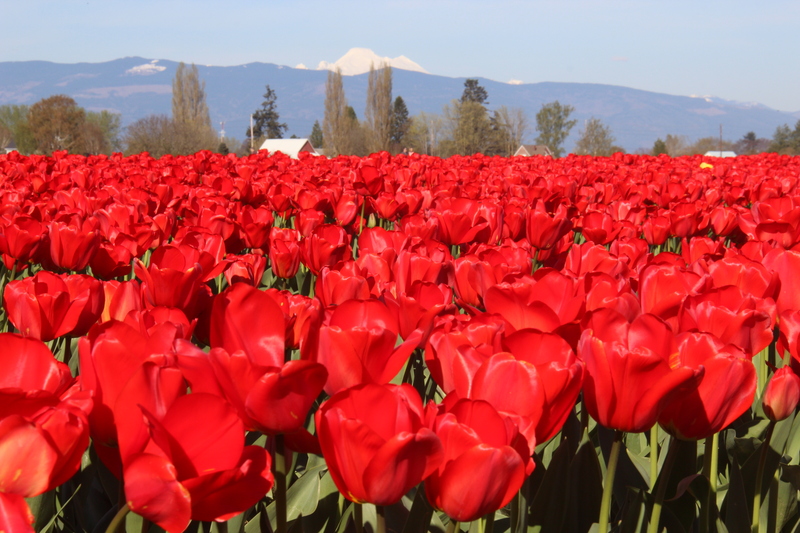 The fields cover a huge area of Skagit Valley, and there are many ways to get there, but I recommend getting off I-5 at Mount Vernon and starting at Roozengarde for both the tulips and daffodils. 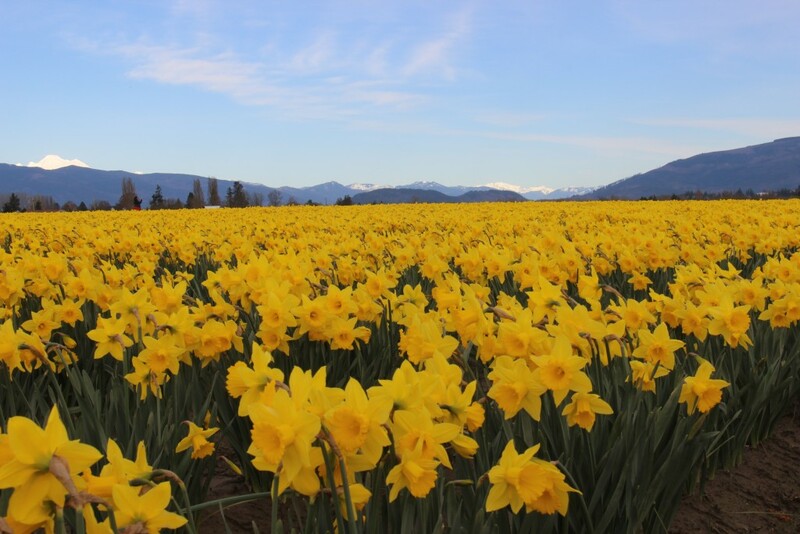 It’s a large farm centrally located in the fields, so it’s a great place to park and get your first introduction. 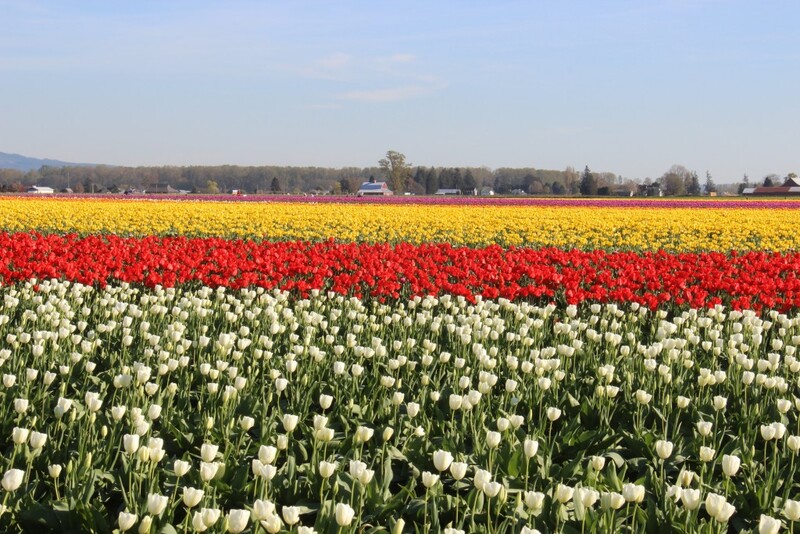 They have a small shop with souvenirs and information, and they’ll also tell you which fields are currently blooming, so that you know where to head next! 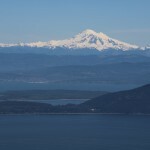 I was so excited that it was clear enough to see Mount Baker in the distance! 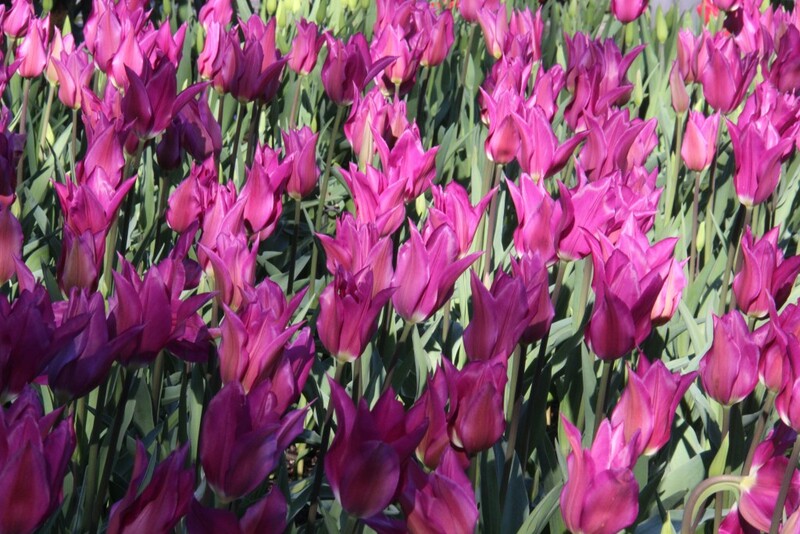 After seeing how gorgeous the fields of daffodils were, I knew I had to come back to see the tulips as well. 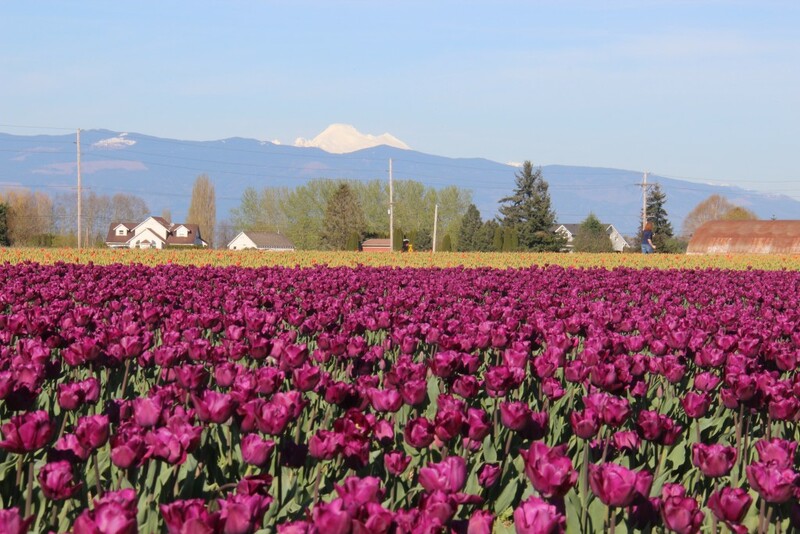 So, a few weeks later when we heard that the tulips were blooming, I dragged J back up to Skagit Valley (he’s really loving the drive at this point! 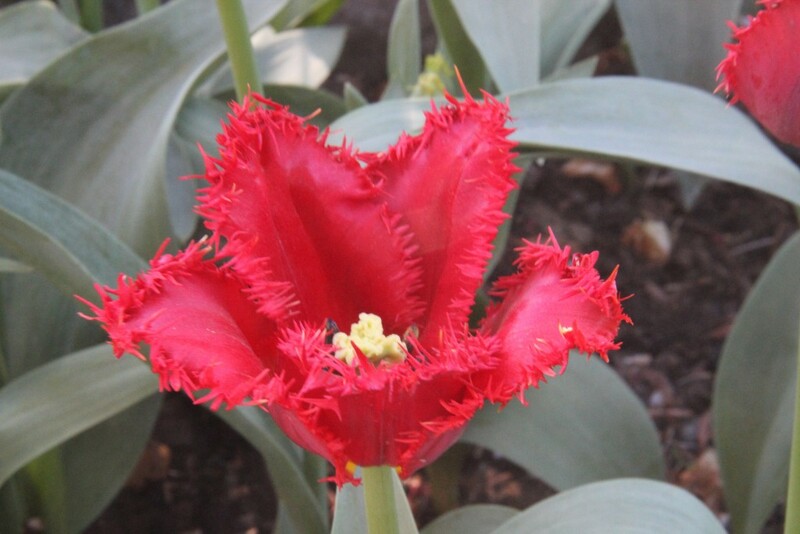 – sorry J!) 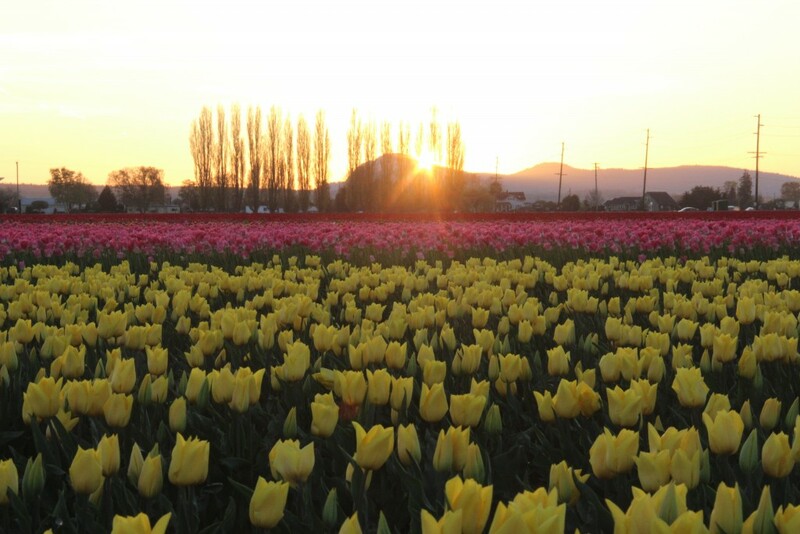 for more exploring. 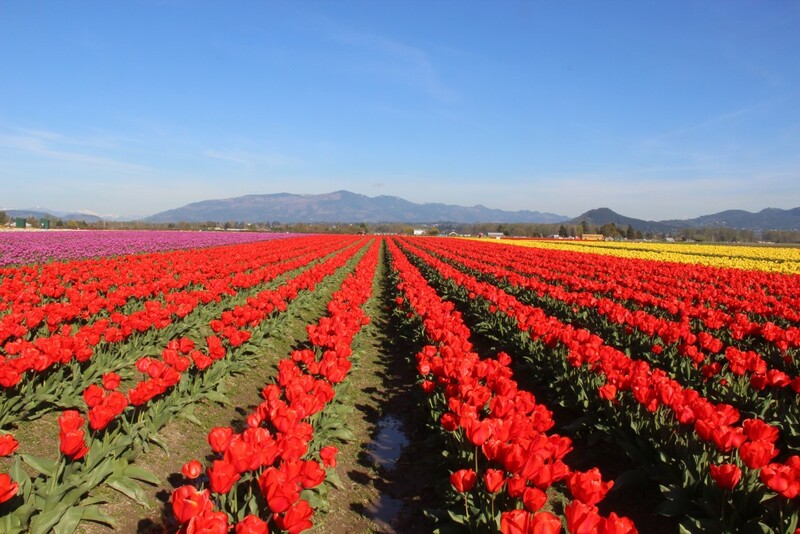 We started off at Roozengarde again (There’s a $5 fee for parking during tulip season, fyi). 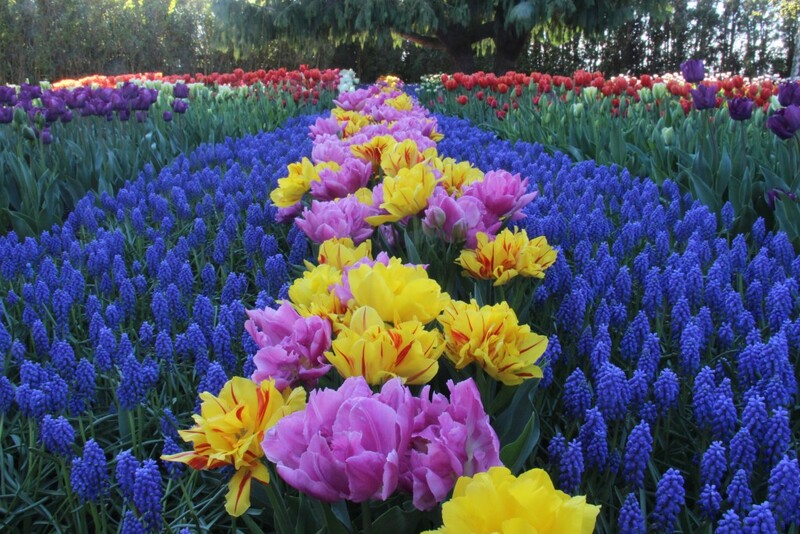 They’ve got a gorgeous garden on their property, so take some time to walk through there before heading out to the fields! 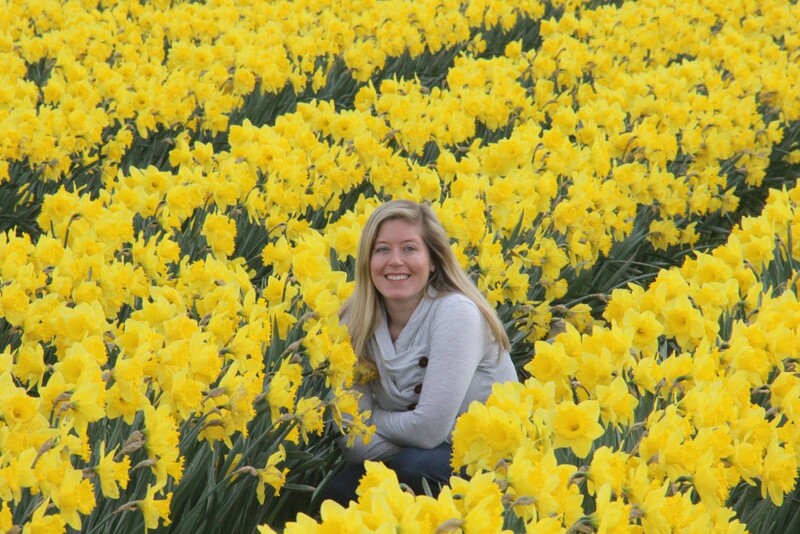 I had been amazed at how many daffodils there were in March, and the tulips were even more incredible. 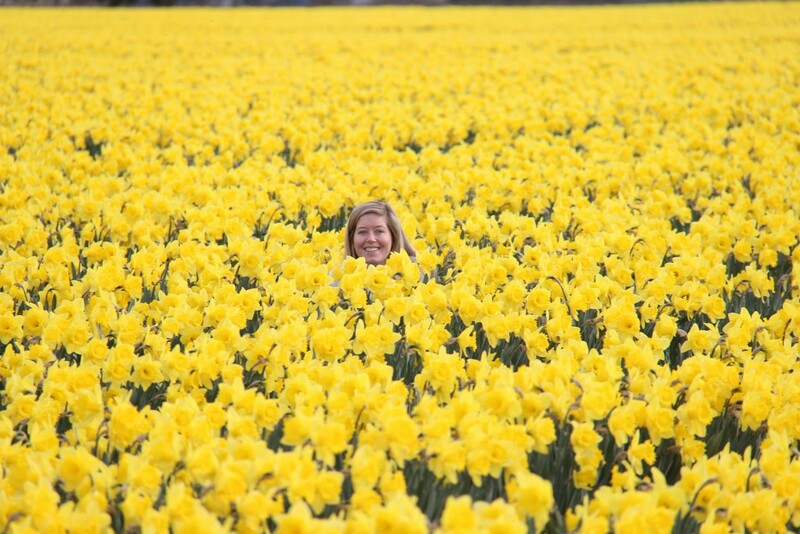 I had absolutely no idea there were so many varieties! 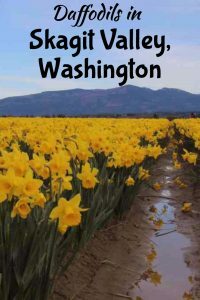 We ate dinner in Mount Vernon, the little town you drive through on your way to the fields. 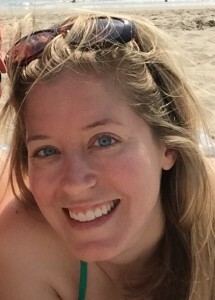 I highly recommend The Porterhouse. 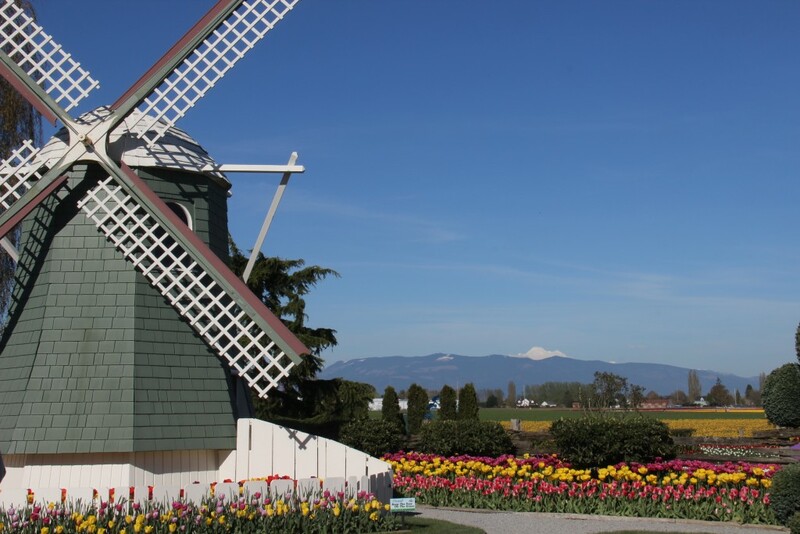 They’ve got great food and a wide selection of local beers. 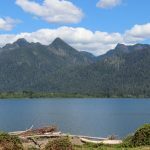 It’s right along the Skagit River, and we enjoyed walking along the riverfront for a bit while waiting for the sun to go down. 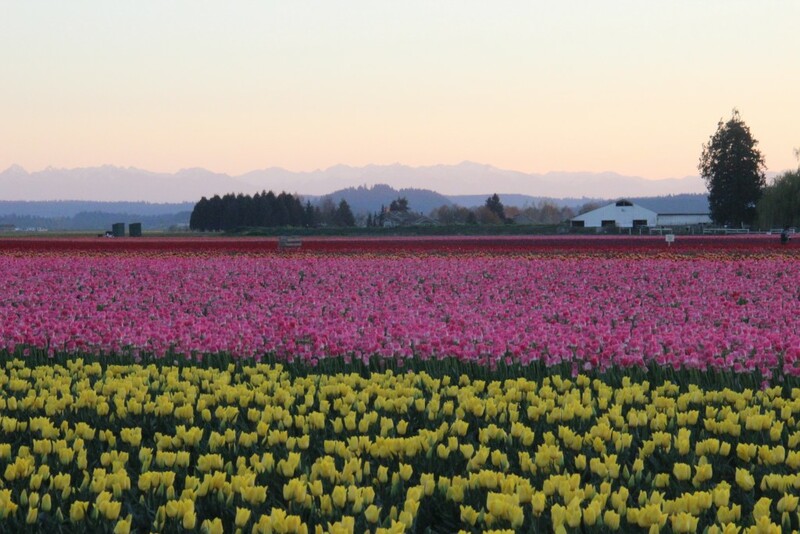 As the sun started setting, we drove back out to the fields and got some beautiful shots with the Olympic Mountains in the background. 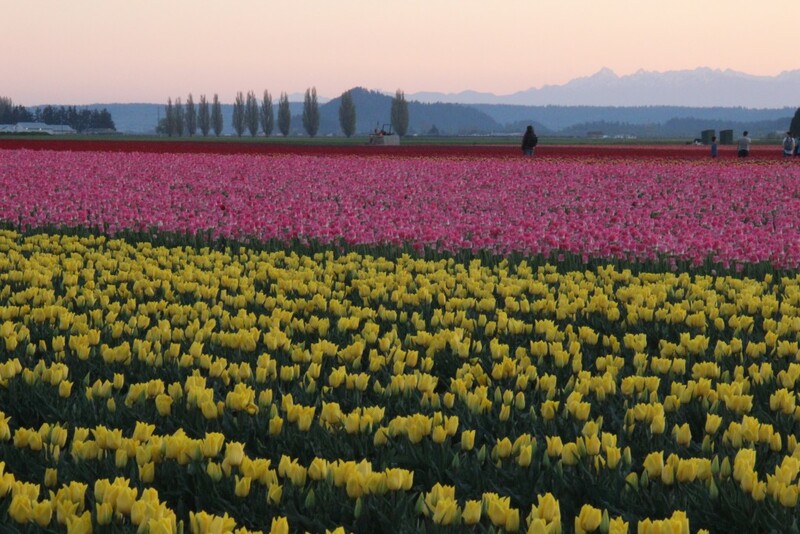 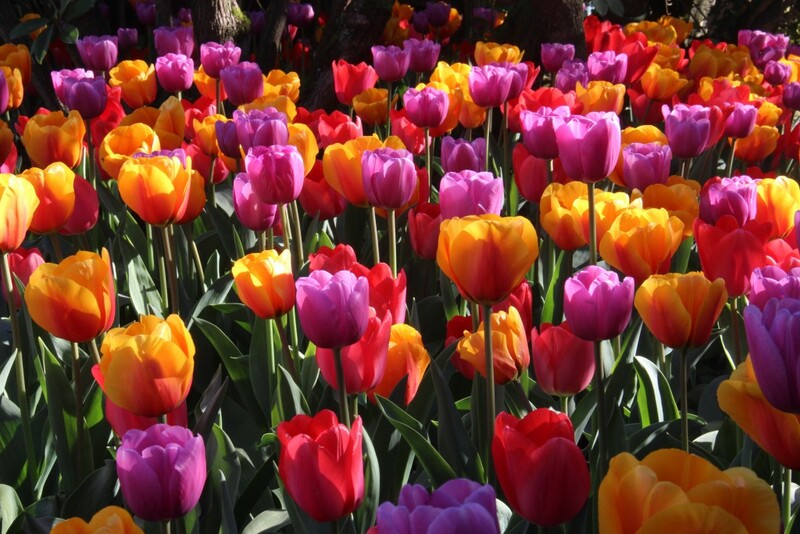 If you’ve never been to the Skagit Valley Tulip Festival, you should definitely add it to your list to see someday. 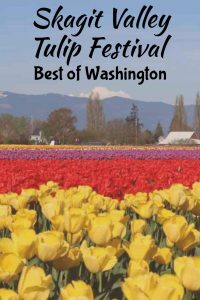 It’s worth the drive north from Seattle and something you should experience at least once! 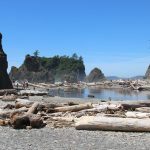 Looking for other day trips from Seattle? 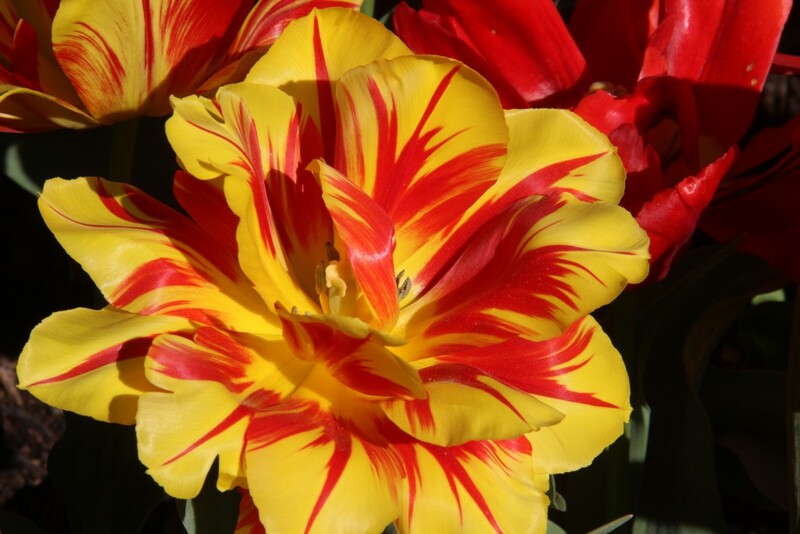 Check these out too! 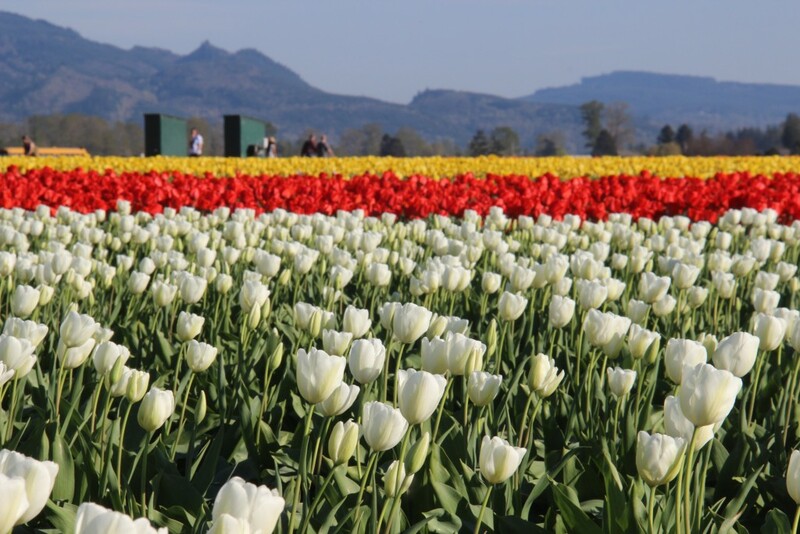 Orcas Island and San Juan Island – the Anacortes ferry terminal out to the San Juan Islands is not far from the tulip fields, so these trips would be easy to combine at the right time of year! 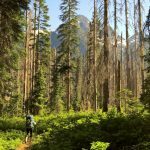 Diablo Lake – another gorgeous spot in the North Cascades, about an hour and a half from Roozengarde.